Panama City, Panama. 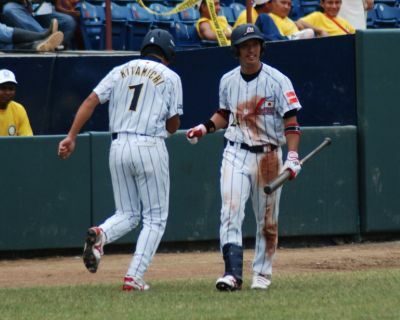 Japan has finally won its first game at the 2011 IBAF Baseball World Cup. They prevailed in a pitcher’s duel against Chinese Taipei on Friday afternoon at Rod Carew Stadium in Panama City. Team Nippon took the lead with a two-run third and never looked back. The game saw just eight hits overall, as both defenses dominated for most parts of the contest. Chun Hsiu Chen hit a solo homerun for Chinese Taipei, which remains winless after five games in the tournament. Chinese Taipei however had the better start. After a scoreless first Chun Hsiu Chen opened the next period with a solo homerun over the left field wall. However it would be the lone run in the game for the team from the Asian island. And this wouldn’t be enough to celebrate a win. Japan turned the score around in the third, when Takato Kobayashi delivered a two-out two-run single for a 2-1 advantage. One frame later Mayo Sakagami pushed a third run over the plate with a sac bunt, extending the lead to 3-1. The big star of the match was Naobumi Mitsuhashi (W, 1-0). He went the distance, allowing just the solo homerun, a pair of singles, a walk and a hit batter in nine innings. He struck out ten and faced just five over the minimum in the first complete game of the tournament. Yao Lin Wang (L, 0-2) was charged with his second loss, conceding three hits, two runs and three base on balls in three innings. Chinese Taipei is now looking for its first victory on Saturday, squaring off with Greece at Remon Cantera Stadium in Aguadulce. Japan will be on the same field a few hours later, taking on Puerto Rico.